The 35-year-old Collins will sign a 10-day contract and be in uniform by Sunday night. The Brooklyn Nets announced Sunday that they have signed Jason Collins, making the free-agent center the first openly gay athlete playing in one of the four major North American sports leagues. "The decision to sign Jason was a basketball decision," said Nets general manager Billy King said in a written statement. "We needed to increase our depth inside, and with his experience and size, we felt he was the right choice for a 10-day contract." Collins will be on a 10-day contract with the Nets and be in uniform for tonight's game against the Los Angeles Lakers. 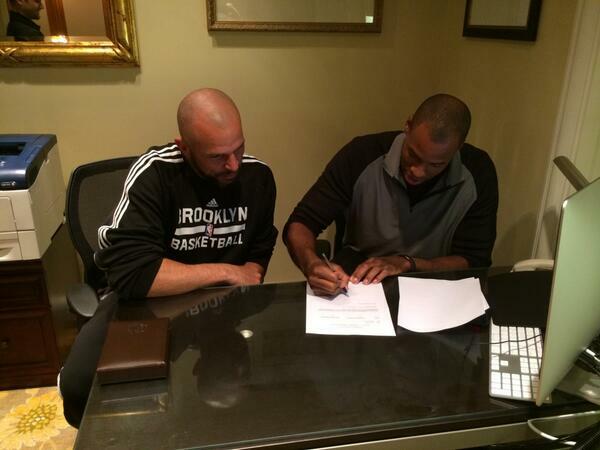 Official: The #Nets have signed @jasoncollins34 to a 10-day contract. Collins made headlines last spring when he announced that he was gay, only weeks after finishing the regular season with the Washington Wizards. The 12-year veteran has said many times since then that he's in the best physical shape of his career, but still no NBA team had offered Collins a contract. But early last week, Collins went through a private workout for the Nets in Los Angeles. Nets general manager Billy King confirmed that report Thursday. Asked to share the feedback he received on the 35-year-old Collins, King told reporters during a conference call: "He's in shape." "He's one of the names on the list," King said of Collins. "We will look at anybody that's a free agent that's big that's out there. We're looking at any guys that are free agents and he's one of the guys. But we've got other guys that we'll look at." New NBA Commissioner Adam Silver issued a statement shortly after news of Collins' signing. "Jason told us that his goal was to earn another contract with an NBA team," Silver said. "Today, I want to commend him on achieving his goal. I know everyone in the NBA family is excited for him and proud that our league fosters an inclusive and respectful environment." Collins has a number of relationships with people in the Nets organization, including head coach Jason Kidd and current players Kevin Garnett, Joe Johnson, and Paul Pierce — all of whom Collins has previously played with. The 7-foot-tall Collins should be a good fit with the Nets, who are in need of size after losing starting center Brook Lopez to a season-ending injury. Collins also spent the first seven years of his career with the Nets when they played in New Jersey. With career averages of 3.6 points and 3.8 rebounds, Collins won't be called upon to do much beyond provide defensive toughness and a veteran presence at the end of the team's bench. Collins' 10-day contract is common in the NBA, a deal used mostly to fill out the final spots on a club's bench. If Collins lasts through the end of the contract, he can be offered a second 10-day deal. When that ends, he must be signed for the rest of the season or released. But Collins' impact will likely be felt well beyond the court, especially for those who have worked in LGBT advocacy in sports. "The signing of Jason Collins is historic in the world of sports and for our country," said Wade Davis, executive director for the You Can Play Project, an advocacy organization working to eradicate homophobia in professional sports. "Jason will continue to inspire all people not just the LGBT community And it's fitting that Brooklyn, a city famous for its diversity and transformative sports figures like Jackie Robinson, Vince Lombardi, Michael Jordan, and others would be the place where another barrier is shattered." Said Brian Ellner, founding board member of Athlete Ally, "Today Jason Collins tore open the last remaining closet in America, and became the first openly gay player to be signed by a team in one of the big four sports. We are especially excited that Jason will be playing in Brooklyn, just like Jackie Robinson. And in a marriage equality state. This is a piece of history, an important point on the continuum toward justice and a moment to celebrate." Collins' signing comes exactly two weeks after University of Missouri defensive end Michael Sam, the SEC's co-Defensive Player of the Year, announced he was gay. But timing will ultimately prevent Sam from becoming the first openly gay athlete in one of the four major North American sports leagues: Sam needed to first be drafted, make an NFL roster and play in a game this fall to break that barrier. When Sam made his announcement on Feb. 9, Collins tweeted that he was "a great young man who has shown tremendous courage and leadership." Sam, who is currently participating in the NFL Scouting Combine in Indianapolis this weekend, returned the favor with a tweet Sunday. Collins' twin brother Jarron, a retired NBA player, also hinted earlier Sunday that signing was imminent. Hope everyone is enjoying their Sunday. Today should be a pretty cool day! Very excited to watch @jasoncollins34 tonight more importantly I am proud to call him my friend. Update — Feb. 23, 4 p.m., ET: The Nets and NBA both released statements following Collins' signing.